Disney, Fox, Sony Pictures, Universal and Warner Bros. have all teamed up with a new app called Movies Anywhere, which will allow film lovers to aggregate all of their digital movie copies under one app. That means that if you have digital copies from Amazon Video, Google Play, iTunes and Vudu, you can register for Movies Anywhere and connect those accounts to import all of your digital copies into one app. Also, if you sign up for a free account, you can get up to five free digital titles by linking your existing digital movie accounts to Movies Anywhere. You can check out the official press release below for all of the details, but if you want to get started with Movies Anywhere, you can sign up for free now. 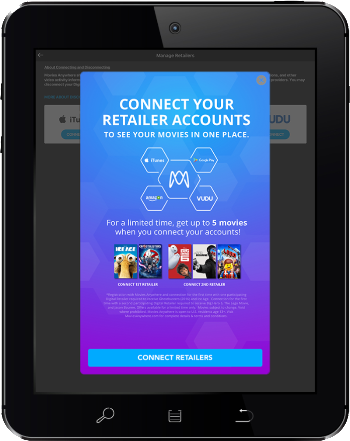 BURBANK, Calif., Oct. 11, 2017 — Movie lovers now have a new home for their favorite digital movies as Movies Anywhere launches in the U.S. today with an unprecedented five Hollywood studios and four major digital retailers on board. Featuring films from Sony Pictures Entertainment, The Walt Disney Studios (encompassing Disney, Pixar, Marvel Studios and Lucasfilm), Twentieth Century Fox Film, Universal Pictures and Warner Bros. Entertainment purchased or redeemed through digital retailers Amazon Video, Google Play, iTunes and Vudu, Movies Anywhere brings the movies people love together to create a simple, seamless digital entertainment experience across platforms. Practice Your Talk Show Host Skills with Avatar Kinect Today! Gaming Tablet From Gamestop? Possibly!